Streaming data is becoming a more and more prevalent form of big data. Everything is generating data – social media, wearable devices, machine sensors, etc. and all connected in the the Internet of Things. Often, you need to respond immediately and have to decide what to do with that data right now. And "right now" could mean 10,000 times or more per second. Streaming analytics are able to capture data while it’s in motion, processing it on the fly – and deciding what to do with that data. All in milliseconds. 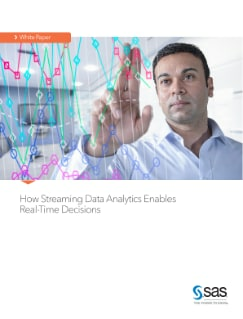 There are some basic tenets on how SAS provides this extremely high-throughput, low-latency technology to meet whatever streaming analytics your company might want to pursue.